HIGHLIGHTS 2019 CTS-V THE SUPER SEDAN, SUPERCHARGED The 2019 Cadillac CTS-V redefines the notion of high performance sedan. The most powerful vehicle in Cadillac’s 117-year history, the V-Series most representative vehicle combines functional design and sophisticated technology. Built to own both the track and the road you ride on, the CTS-V is the pinnacle of Cadillac’s performance design. PERFORMANCE SUPERCAR-LIKE PERFORMANCE Refined raw power. Go from 0 to 100 KM/H in 3.7 seconds. The supercharged 6.2L V8 engine of the high performance sedan harnesses an impressive 640 hp and 854 Nm of torque and has the capability to reach 320 KM/H on the racetrack. And for everyday-driving performance, it all works seamlessly with Direct Injection, Continuous Variable Valve Technology and Active Fuel Management. 8-SPEED AUTOMATIC TRANSMISSION Responsive shifting. The 2019 CTS-V performance sedan houses an 8-speed automatic transmission that was tuned and tested on the track. Shift through all 8 speeds seamlessly and automatically select the right gear with Performance Algorithm Shifting to improve lap times or use manual mode by tapping the magnesium paddle shifters mounted on the steering wheel for a truly hands-on experience. PERFORMANCE TRACTION MANAGEMENT Complete control. Performance Traction Management provides you with competition spec traction and stability controls. Select from five modes specifically for the track: Wet, Dry, Sport 1, Sport 2 or Race – to adjust for appropriate conditions. TECHNOLOGY PERFORMANCE DATA RECORDER Race. Analyze. Race better. Exclusive to the V-Series and its segment, the available Performance Data Recorder offers four overlays — Sport, Track, Performance or Tour — that enable drivers to record their experience by capturing real-time video, audio and performance metrics. The front-view camera captures each exhilarating curve and straightaway, and when parked, lets you watch and analyze your driving performance on the Cadillac user experience screen. Or you can save the footage on the SD card to watch or share your performance later. Use Cosworth Toolbox software to analyze your CTS-V recorded performance data. 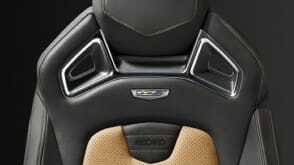 BOSE® PREMIUM SOUND SYSTEM Envelop yourself in beautiful sound. The 13-speaker Bose® Surround Sound System features Advanced Staging Technology, an innovation that creates an immersive sound experience to bring you the feeling of being front row, center stage. Furthermore, AudioPilot® 2.0 noise compensation technology continuously adjusts the volume to compensate for the effects of background noise and vehicle speed.Furthermore, AudioPilot® 2.0 noise compensation technology continuously adjusts the volume to compensate for the effects of background noise and vehicle speed. CURBVIEW CAMERA4 Less surprises. A unique CurbView Camera can help you protect the V-Series front splitter from damage when parking. Automatic Park Assist also guides with parallel and perpendicular parking scenarios. INTERIORS 2019 CTS-V THE RACE CAR, REFINED A most immaculate performance machine. The 2019 CTS-V presents exquisite finishes, refined touches and a superior cockpit, all crafted with only one thing in mind: the driver. Comfort that delivers. The 2019 CTS-V features standard 20-way heated and ventilated performance-oriented seats, trimmed in semi-aniline leather and V-signature sueded microfiber inserts. You can also choose the available race-inspired RECARO ® 16-way power seats that make the driving performance even more enjoyable. 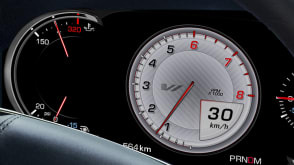 RECONFIGURABLE INSTRUMENT CLUSTER Personalize your dash. The customizable instrument cluster lets you choose between three themes for the 12.3” high-definition display and the Head-Up Display allows you to be aware of select vehicle information, projecting it on the windshield, right in front of your eyes. EXTERIORS A MORE DYNAMIC AERODYNAMIC Every curve, edge and line thought throughout. Contributing to lift reduction, enhanced cooling and improved aero performance, the CTS-V 2019’s functional exterior design commands attention. With an athletic stance, wide body and low height, the vehicle’s appearance is both aggressive and intelligent. V-SERIES GRILLE An upfront statement. With an exclusively designed open-mesh upper and lower V-Series grille, the 2019 CTS-V makes a memorable arrival. And it is aerodynamically designed to maximize airflow into the cooling system, including outboard coolers that maximize airflow to keep the supercharged V8 engine cool. BOLD EXTERIOR ACCENTS Every detail elevated. A finely tuned quad exhaust announces your arrival, while imposing 19” lightweight forged aluminum V-Series wheels combine attitude with function.